The club’s longest serving player, the 2019 season will be Jamie’s 20th with the club, is thirteenth position in the club’s all-time appearance records. He is the only player in the squad to have won the first Super League title with the Rhinos in 2004. One of the most passionate, honest and competitive players in the Rhinos squad Jamie has been fundamental to the team’s success and has won every honour in the game. A popular character on and off the field, Jamie is a former Stanningley player who is proud of his roots and his commitment to helping the community and the Rhinos team combined with a great sense of humour and enthusiasm has endeared him to the Leeds public and made him a real local hero. 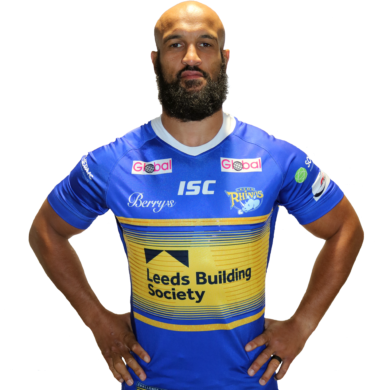 He has fought back from injuries to be part of the most successful era in the club’s history and has twice been awarded for his commitment to the community and is also a trustee for the Leeds Rhinos Foundation. Two years after signing from Stanningley Jamie made his first team debut but despite this promising start, frustration followed when a series of niggling injuries hindered his progression in the first team. By 2002 he was back to full fitness and went onto make 22 appearances and scored his first ever try for the club against Salford. In 2003 he made a further 11 appearances but in 2004 Jamie was able to flourish thanks to an injury free season. He came on from the bench in the Grand Final against Bradford Bulls when the Rhinos secured the Championship for the first time in 32 years before going onto be named Carnegie World Club Champions in 2005. After another impressive domestic campaign in 2006 he won international recognition when he was selected for the England squad for the Federation Shield tournament and he showed that he could perform at this level, scoring a try in the opening game against France. In 2007 Jamie was an ever present for the Rhinos and his impressive season culminated in him scoring a try in the Grand Final win over St Helens before going onto make his Great Britain debut in the Series whitewash over New Zealand. In 2008 after his success with the Rhinos Jamie was once again recognised for his achievements by being named in the England squad for the 2008 World Cup in Australia. Jamie first represented England at schoolboy level in 1997 before going onto play for the Great Britain Academy in 1998. He was also part of the England A touring side in 2002 where he scored a try in the opening Test win over Fiji. In 2010 he made 31 appearances including the World Club Challenge and the Carnegie Challenge Cup and his performances led to him being named as runner up in the Player of the Year awards for the second time. He enjoyed one of the his best seasons in the blue and amber shirt in 2011, being named as the Rhinos Player of the Season and going onto win his fifth Super League title. He also earned a call up to the England squad and played in all four of their Four Nations games. The 2012 season saw Jamie suffer a knee injury against Manly that kept him out of action at the beginning of the season but he returned to play in the Challenge Cup and Grand Final and his form earned for the Rhinos earned him a call up to the national team and he appeared in the successful Autumn international series and scored a try against Wales. A number of injuries during the 2014 kept him out of action but he returned to play in both the successful semi-final and Final of the Challenge Cup when he finally got to lift the famous piece of silverware for the first time in his career. The following season he made eight appearances but a serious knee injury suffered in the Cup semi-final ruling him out for the remainder of the season. He was runner up in the Player of the Year awards in 2016, which was a difficult year for the cub as they finished in the bottom half of the table and had to compete in the qualifiers for the first time to secure their Super League status. He was a regular during the 2017 season and finished the year in the Grand Final squad to face Castleford, winning his seventh Super League title. He played in his seventh World Club Challenge against Melbourne at AAMI Park in 2018 and although injury ruled him out during the campaign he returned to play a key role in seeing the side retain their place in Super League in the qualifiers. A real character of the game whose enthusiasm and dedication to everything he does has made him a crowd favourite and a respected teammate. He combines his playing career as a producer and presenter on TV show Rugby AM. K-Bins aim is to continue to produce storage products that are affordable, durable and save valuable space prior to use. K-Bins are flat packed and supplied in outers for protection, they are quickly assembled and ‘in use’ on your shelves in minutes. The experience they have gained over the years has resulted in their large range of stock sizes being compatible for most of the popular shelf dimensions on the market.